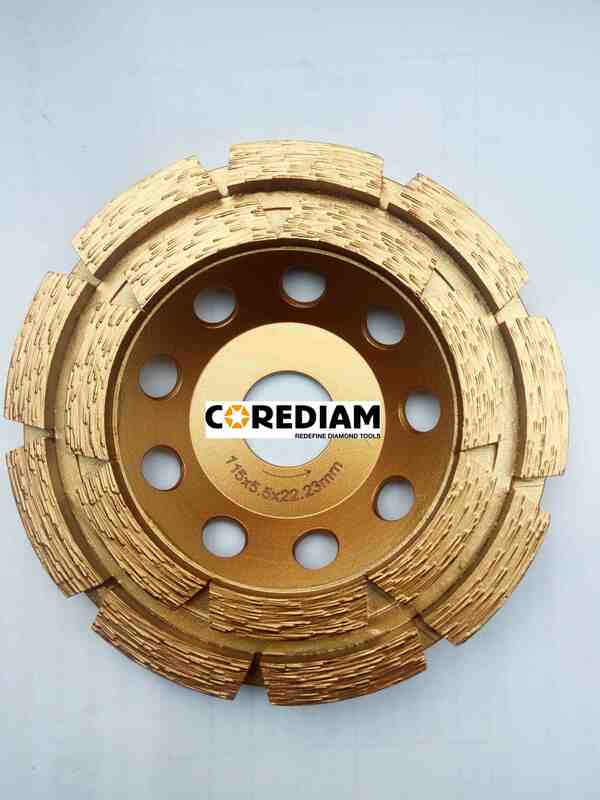 The Grinding Cup Wheel is double row segment, it is designed for faster and fine surface grinding on different kinds of concrete and masonry materials with super efficiency. More active segments offers a long grinding life. This Double Row Cup Wheel is applied from soft to abrasive concrete and other masonry material. The design of base is with center hole and drain holes. The manufacturing technique is silver brazed. the diameter is from 4 inch to 7 inch. We also supply other kinds of Grinding Cup Wheel, such as Grinding Disc and Aluminium Based Cup Wheel. Each cup wheel has its seperate box, usually 50 pcs are in one carton. For sample order, customers can choose fast express like DHL,UPS,TNT and EMS, door to door service,for the bulk order or the weight over to 50kgs, we can choose by sea or by air,port to port service. Sample delivery: If we have stocks , then the delivery time is within 10days after we got your sample payment. If we don't have stock, the delivery time will depends on the sample production. Normally, for bulk order, delivery time is usually 3-4 weeks after payment confirmed. Looking for ideal 115mm Double Row Abrasive Cup Wheel Manufacturer & supplier ? We have a wide selection at great prices to help you get creative. All the 115mm Double Row Cup Wheel are quality guaranteed. We are China Origin Factory of 115mm Double Row Abrasive Wheels. If you have any question, please feel free to contact us.